Today is June 13th, 2016, so if you’re reading this at some point in the future, maybe you will or maybe you won’t remember that this is the day after an unspeakable, world-shattering act of gun violence here in the United States. I came home from the studio on Sunday night after teaching a workshop over the weekend, and I settled into the couch with my phone and my cookie to get in the Mindless Introvert Zone and opened up my social apps and there it was all over everything: the news. And my brain trying to process it: no no no no no. This morning as I sit here at my little breakfast counter trying to write this post about Korean BBQ Yum Yum Rice Bowls, I’m just way lost. Even for as much as I love food and adore these bowls and feel so lucky to write about all things delicious and good, the words feel – or ARE – completely awkward today. Writing about something called YUM YUM RICE BOWLS right now… it feels flaky at best, offensive at worst. So instead I’m just kind of aimlessly typing and pausing and staring into my tea latte that has long since gone cold, feeling overwhelmed and sad and bleary-eyed behind my glasses and being okay leaning into that, and also knowing that somewhere there are people feeling that searing loss in a much more acutely personal way and wanting and needing to have my eyes open to that. I’m saying, in the words Jen Hatmaker: I see this evil and I condemn it fully. As is often the case when things start to fall apart, I’m finding slivers of hope and encouragement from thought leaders and loving communities all by way of the amazing internet — I mean, it’s not always what it should be, but these are the times when I think we can really use our 21st century connectedness to find each other. To learn, to listen, to love and to have a voice for good in times when the world feels like a dark and scary place. I hope we feel that even here, on a food blog. We see it, we name it, we condemn it, and we stand with each other on the side of good. I think one of the only ways to bravely move forward in these dark days is to do what tiny little things we can to restore the balance – to keep the goodness coming. There is so much of it in each of us in our food and our homes and our hearts, right? Do you feel that? We have to tirelessly bring it all day every day. If love is the majority and love > hate, right now, for many of us, food can be our symbol of love and our practical way to right the balances. So today my tiny act of proactive love and goodness for the world looks like a bunch of delicious food in a bowl. Comfort, love, nourishment. It’s marinated Korean BBQ type steak served with kimchi (spicy, cause I added garlic chili paste and it has since become a necessary upgrade in my life) and white rice, although cauliflower rice has also happened up in this house and it was not disappointing, but sometimes life calls for white rice and nothing but white rice. Then a little side dollop of that yum yum sauce I obsessed about a while back, and of course, OF COURSE, the crown jewel – a perfectly soft poached egg on top in honor of all things good and right in the world. As with most good things, this starts with a nice food processor concoction of ginger and garlic and – wait for it – a pear. I watched this video and learned about using pears for Korean meat marinades, so now I use pears and it kind of feels like I know what I’m doing. Kind of. This delicious garlic-ginger-pear paste goes right on the meat – and then things get easy and loose, if you’re okay keeping it loose. Just cover the meat with soy sauce and brown sugar (about equal parts of each) and add a quick stream of sesame oil. That’s it. Let that meat sit around for a while to get delicious and then fry it up on a super hot skillet for just a few minutes. It’s going to get golden brown and sticky, and if your pan is hot enough, it’s going to get an awesome sear on it and as a result it is going to rock your world. And then the leftovers are going to rock your world five times over. And this is what joy in a bowl looks like. It doesn’t fix all the broken things and I don’t want to pretend it’s even on the same level. Not even for half of a second. 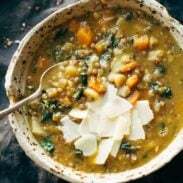 But in the name of all that’s good and precious and love-filled, it’s one ping, a tiny act, a slow baby step towards rightness in the way of our daily act of putting awesome and comforting food on the table. Make and eat and share good food. Remember. We belong to each other. 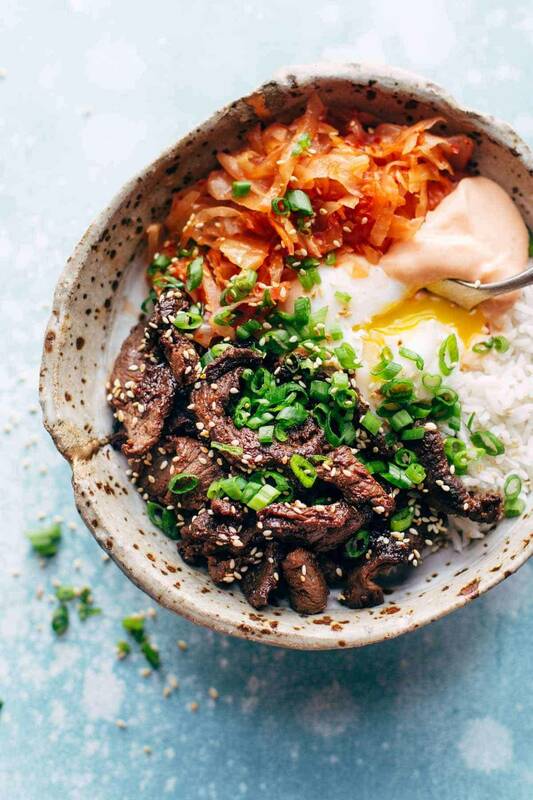 Korean BBQ Yum Yum Rice Bowls: easy marinated steak, spicy kimchi, poached egg, rice, and yum yum sauce! SO good and so easy! MEAT PREP: Cut the steak into very thin bite-sized pieces and place in a mixing bowl. Peel the garlic, ginger, and pears. Pulse in a food processor until a paste forms. Add the paste to the meat and stir to combine. Cover everything with soy sauce, brown sugar, and sesame oil – just enough to cover and marinate. Your ratio should be roughly 4 parts soy sauce, 4 parts brown sugar, 1 part sesame oil. Mix it all up and refrigerate for 30 minutes or so. MEAT COOKING: Heat a large heavy-duty skillet over very high heat. Discard remaining marinade and add the steak to the pan. Sear for a few minutes, flipping it around once or twice, until your meat has a really nice golden brown exterior. Set aside. BOWL ASSEMBLY: Arrange the rice, kimchi, greens, and steak in a bowl. Add the egg on top and sprinkle with sesame seeds, scallions, and Yum Yum Sauce. Mwah! You’re a boss. Speaking of passionate people bringing their good to the world, I should mention that this recipe was inspired by the creative awesomeness of the yum yum bowls at World Street Kitchen in Minneapolis. Carry on, food innovators! Your last lines made me well up, Lindsay. A beautiful post, beautifully expressed. Thank you. Your words are so spot on, and completely echoed what is in my heart today. The bowl looks beyond delicious and your words gave me some comfort. Thank you! Thank you Ellen. Now if only we could hand out the actual bowls to people while having these hard conversations face to face. <3 maybe some day. come on, technology! I agree with you; sometimes all we can do to combat pain and senselessness is to invest in the little things every day that make our lives meaningful. In the end, life is made up of all those tiny moments, strung together, and they matter so much. Thanks for this post today. Still haven’t tried yum yum sauce yet but it’s on my list for this week! Good news – it only takes a few minutes to make. 😉 Thanks for the thoughtful comment Michelle. Really appreciate your voice here on POY. This was a beautiful post, and appropriate quote by Jen Hatmaker. We need to show much, much more love to those around us. Yes. and the thing I love about the Jen Hatmaker quote is the concept of not staying silent. Glad you find hope and encouragement in it, too, Trebecca. Sliver of hope reading your uplifting words today. Beautifully written, Linds. Thanks Sally. That means a lot. We love you right back. Thanks for a great post. I have no other words today. Thanks for your thoughtful post, Lindsay. It’s a relief to know that other people are struggling today, too. I’m pretty sure I could eat this every day! Pinned! I’ve been following and cooking “with you” for a while and hope to one day have a blog of my own. With that said, as a gay 50 something my heart is broken; I can’t say enough good things about reading you post today. It’s so good to feel the love. THANK YOU!! Thank you Gary! <3 so glad to have you here on POY and much love to you! From Sydney Australia we too are horrified at the terror unleashed on those innocent people enjoying a night out with friends. What i will never understand is the US reluctance to eliminate guns from every day life. To be honest, I think all of us are lost too. With the Stanford injustice, upcoming election and chaos occurring all over the country nowadays, it’s hard not to wonder what to do next and to fear for the future. I think all we really have to do is persevere together and as a people, fight for what is right and what we believe in. If you remember throughout history with civil rights, the prohibition, slavery and the Vietnam War, you’ll see that through extremely difficult times, we as a nation came together and we learned so much from each other. That was the beauty of it all. Omg, this rice bowl looks fabulicious!!!!! I am so down! The name of this recipe is so fun! And I am in love with the bowl you used in these photos, it has so much character. Where did you get it? I live in Orlando. Thanks for these comments. Love to you all. Thanks for the post, with its well chosen words. South Africa may be far in miles but in hearts and thoughts we are a breath away. Such a beautiful tribute! Well said, Lindsay! That garlic-ginger-pear paste sounds ahhmazing! I’m not gonna lie I’m infatuated with these bowls you’ve been using lately, where did you get them from?! The bowl is actually made by Lindsay’s father-in-law! I can’t wait to try this! I have made a number of your “bowls” and they are delicious! I always look forward to the next bowl. Can you please tell me, where did you find your bowls? I adore those, used to have them eons ago, but they are gone. I would love to replace them. Hi Julie! The bowl is actually made by Lindsay’s father-in-law. I will definitely try this recipe. It looks delicious. I thoroughly enjoyed the link to Maangchi…she is fantastic! Very delish! Going to introduce this recipe to my students! Quick question, what brand/type of kimchi did you use in this recipe? We used Spirit Creek Farm! Beautiful post, Lindsay. Very well said. A great way to shed light on such a tragic event. The amazing thing is food can be healing, I relate to your connection!